To ring in the new year, I brought Jess to Pouring Ribbons, a newly tucked away cocktail bar deep in the East Village (big thanks to Alice for introducing me to this gem)! A project undertaken by Alchemy Consulting (bartenders/owners Joaquín Simó, Toby Maloney, Troy Sidle, and Jason Cott), Pouring Ribbons was opened during September 2012 in a second level space on Avenue B. Alchemy Consulting set the bar high for Pouring Ribbons, that is, in terms of impeccable service and welcoming hospitality as well as inventive and creative yet approachable and comfortable cocktail offerings. Mr. Simó told Serious Eats that he "wanted any kind of drinker to feel comfortable at the bar and not to feel like they're at a temple of mixology where they're obligated to order a cocktail." In fact, the bar offers many noteworthy beers for those advocates. The bar counter at Pouring Ribbons. How awesome is it that Imbibe magazine named the bar as the year's best cocktail bar?! 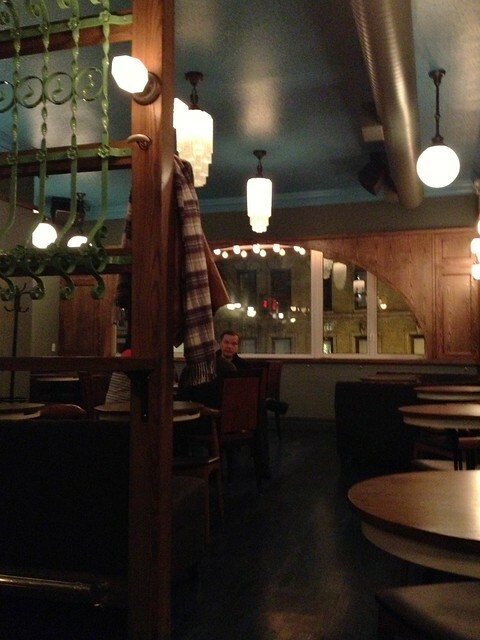 The other seating area at Pouring Ribbons. 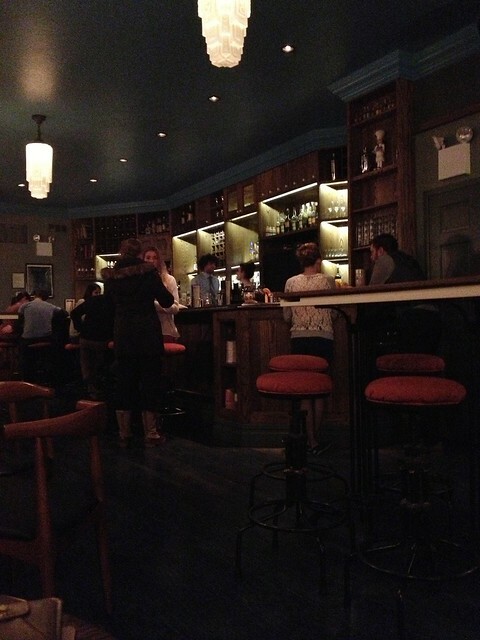 The menu is specifically designed to be user-friendly with fifteen original "house" cocktails and just as many classics (Manhattans, Negronis, etc.) 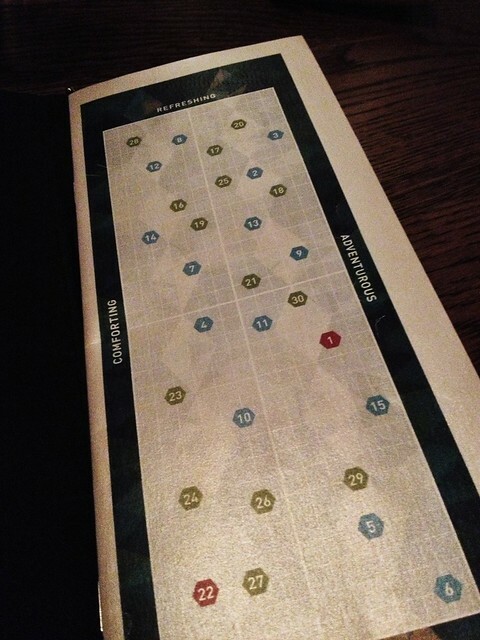 -- drinks are "plotted on a grid with four quadrants: refreshing, spiritous, comforting, and adventurous." These scales are again reiterated beneath each drink so the reader is relatively aware of what to expect with respect to the cocktail's ingredients (adventurous/comforting) and overall taste (refreshing/spirituous). Now, don't be fooled about the "classics" on the menu -- while these familiar concoctions do not deviate much from their original composition, Pouring Ribbons aims to show its patrons their interpretation for them. 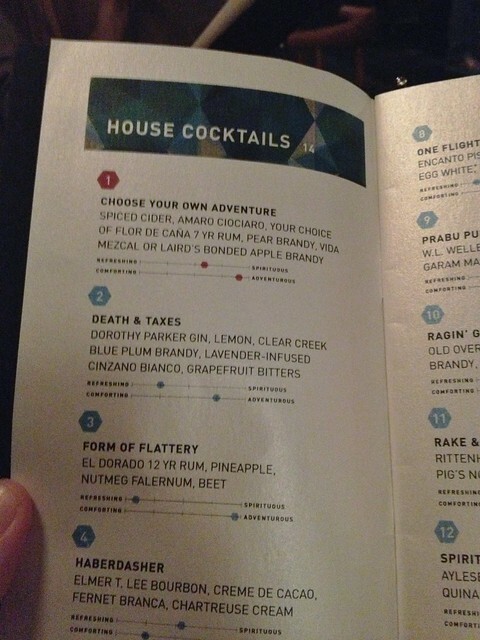 The names tagged to each of the cocktails at Pouring Ribbons are curious and inviting. The descriptions are a catalog of included ingredients with no further explanations offered in terms of what to expect -- preparation-wise or flavor-wise. The level of curiosity alone makes the experience here that much more exhilarating. Another fun fact is that the bartenders at Pouring Ribbons "literally draw the drinks" as they come up with them -- "sketching them out" as "a round of drinks coming to a table should all have distinctive visual appeal." You can definitely tell from just looking at the first round of cocktails we ordered (see below). I started out the evening with Lust for Life (on the right) -- an unusual combination of Vida mezcal (a distilled alcoholic beverage made from the maguey plant -- a form of agave), pineapple, Lustau Peninsula Palo Cortado sherry, orgeat, and cocoa (find the recipe here from Imbibe). If there's one thing I can say about this cocktail is that it is boldly seductive upon first sip. The smokiness from the mezcal (Spanish for "oven-cooked agave") and the subtle nuttiness of the orgeat (essentially a sweet syrup made from almonds, sugar, and rose water) permeate the palate with a tinge of sweetness from the pineapple juice and sherry. The kicker? The sprinkled cocoa on top would seem like it wouldn't work, but it really does! 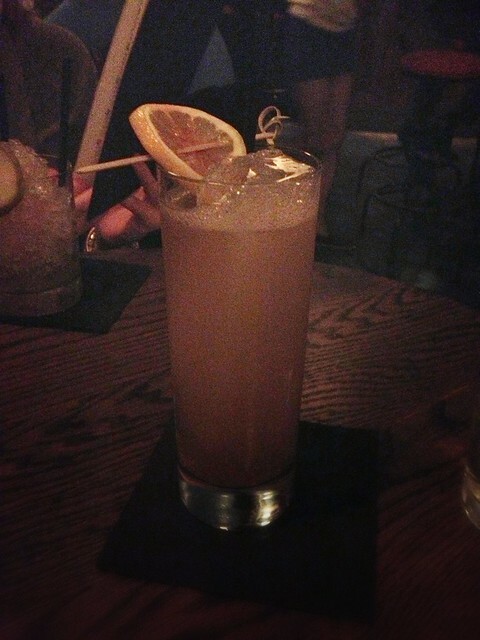 It added a bittersweet quality to the finish of the drink, and alas, Lust for Life became an instant favorite. 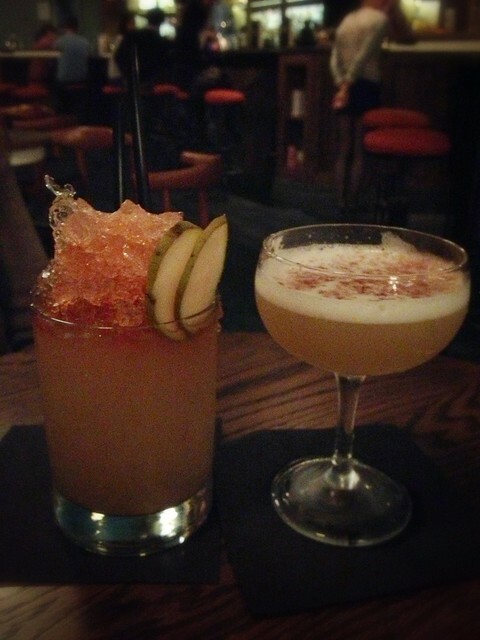 Jess went with the Tahona Smash (on the left) -- Siete Lequas tequila, lemon, Lustau dry amontillado sherry, caramelized pear, and Angostura bitters with crushed ice and a couple slices of pear. Tahona in the cocktail's name refers to the traditional, large stone wheel turned by donkeys, oxen, or tractors in a circular space (typically a cement well) to mash up the pulp of the agave (from which tequila is distilled twice, mezcal once) into a coarse paste and extracted to aguamiel (i.e., the juice, or "water-honey") which is diluted with water to create the necessary consistency for fermentation. I suppose this cocktail is an ode to tequila and the primitive machinery still used in the present day. A very citrus-driven concoction, the Tahona Smash has the qualities of a light sweetness, a smooth sliding tequila-sherry combination, and a little bitterness from the angostura. The ice in the glass gives it an overall sno-cone effect. This comes highly recommended for tequila lovers out there. Round two for me began with the Surabaya Sling -- Banks 5 Island rum, lemon, cocchi di torino (an Italian, Moscato-based vermouth), Spice Trader syrup, and root beer bitters. Sometimes referred to as "the city of heroes," Surabaya is Indonesia's second largest city. Its name is believed to be derived from the words sura/suro (shark) and baya (crocodile), i.e., the two creatures of local myth that fought each other in order to gain the title of "the strongest and most powerful animal" in the area according to a royal Javanese prophecy. I also didn't realize sling is vernacular for a sweetened drink of liquor (in this case, probably for the Italian vermouth). Perhaps to emulate a dual-personality drink of tropical (of Indonesian origin) and warrior-like (of Javanese prophecy) qualities. It truly reflected it once I sampled the drink, especially with its rum base and root beer bitters. Flavors are distinct and strong, but not in an overly-spirited way. Great for sipping! Jess finished the evening with Death & Taxes -- Dorothy Park gin, lemon, Clear Creek blue plum brandy, lavender-infused Cinzano Bianco, and grapefruit bitters. Besides the obvious flavors of citrus -- tart, sour, sweet, and bitter -- the real focus is on gin, and boy is this drink is quite gin-y. There is no escaping the spell in which this cocktail casts on you. The title, after all, comes from the epistolary, famous words of Benjamin Franklin in a letter to Jean-Baptiste Leroy regarding the Constitution: "Our new Constitution is now established, and has an appearance that promises permanency; but in this world nothing can be said to be certain, except death and taxes." The other tastes of lavender and plum complement it very well, too. Findings: Alchemy Consulting can successfully say that its latest cocktail bar project, Pouring Ribbons, is comfortable to any and all drinkers. Its super approachable yet inventive menu (that grid is gorgeous and so practical!) 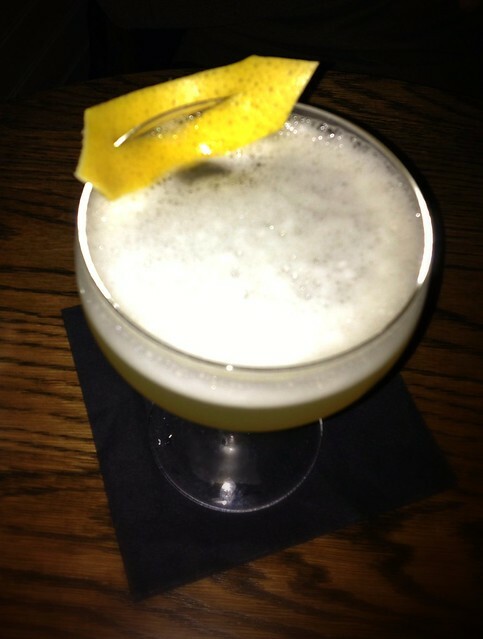 is comprised of house cocktails (original concoctions) and classics (interpretation on traditional beverages) as well as a vibrant selection of beers, wines, chartreuse, and other spirits. I can't imagine a guest walking in and not finding something that is up his or her alley. The world of mixology and all things spirited can be intimidating for those new to it all, and let's face it, pretty pretentious. Pouring Ribbons wipes all of that away so that the snobs, connoisseurs, and newbies can enjoy some striking and colorful cocktails. 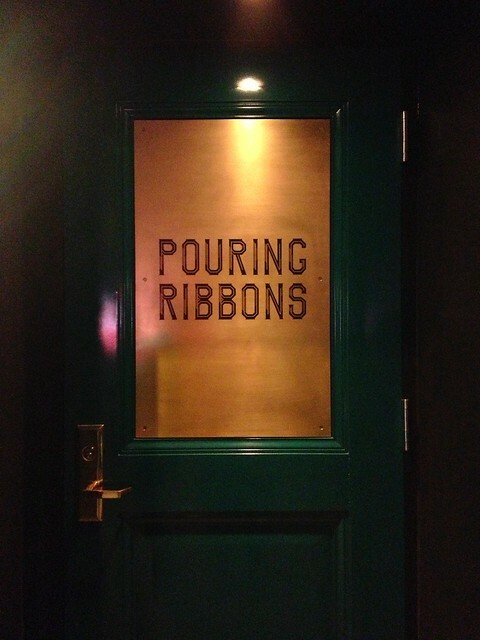 I don't doubt that Pouring Ribbons will be a regularly frequented spot for me in 2013! Price point: $14 for each cocktail. Just out of curiosity, did they have any non-alcoholic options? They actually do -- totally forgot to mention this! They have a nice selection of house-crafted soda concoctions!